When Airline and Parkway took the court against District 1-5A co-leaders Captain Shreve and Byrd, respectively, Tuesday night, there was nothing on the line for the Vikings and Panthers except pride. There was plenty on the line for the Gators and Yellow Jackets — the District 1-5A championship. Both games produced high drama that played out about 10 miles apart in Bossier City. Unfortunately for the Vikings and Panthers, the Gators and Jackets were the teams celebrating when the final horns sounded. Toronco Loston nailed a 3-pointer from the baseline at the buzzer to give the Gators a 45-44 victory at Airline. Montrey Thomas hit a 3-pointer with about 6 seconds left to put the Jackets ahead of the Panthers 70-69 at Parkway. The Panthers were unable to get a final shot off. Parkway’s Brodrick Jefferson (20) scored 28 points in the Panthers’ loss to Byrd Tuesday night at Parkway. Captain Shreve (16-9, 8-2) and Byrd (26-4, 8-2) share the district title. It is the third straight championship for the Gators. Airline closed its season 10-18 overall and 4-6 in district play. Parkway was 11-13 and 3-7. It was a season of what-might-have-been for the Panthers. Six of Parkway’s district games were decided in overtime or by three points or less. The Panthers lost four of them. The Airline-Shreve game was close throughout. Airline led 15-11 after the first quarter. The Gators made a run in the second and looked like they were going to take control. But the Vikings held off the charge and Shreve led 25-23 at the half. Airline freshman Noah Hildebrand scored all six of his points in the third quarter, including a big 3-pointer. Sophomore Jacob Guest hit two free throws with 0.2 seconds left on the clock to give Airline a 37-34 lead. The Vikings extended the lead to 37-32 early in the fourth. But Loston hit back-to-back 3-pointers to give the Gators a 38-37 lead with 4:35 left. Shreve went up 40-37 before sophomore Larry Robinson made two free throws to cut the lead to one with 2:11 left. Shreve again went ahead by three. Tyrise Neal’s layup cut it one with 56 seconds left. With 25.7 seconds left Airline had a chance to take the lead. But senior Austin Brannon missed two free throws. After Shreve’s Tyrone Earls missed the front end of a one-and-one, Brannon redeemed himself, nailing a 3-pointer from the baseline to give the Vikings a 44-42 lead with 12.7 seconds left. After both teams called time out, Shreve inbounded the ball. Airline played tough defense and almost forced a turnover as the clock wound down under 10 seconds. The ball got loose and players from both teams went to floor for it. The Gators managed to gain possession and call a timeout with 2.8 seconds. Shreve got the ball to Loston, who was closely guarded. But his shot from the baseline grazed the rim and went through to give Shreve the win. Neal, a sophomore, led Airline with 12 points. Robinson and KJ Bilbo scored eight each. Earls led Shreve with 11. Jesse McWright, the Gators’ top offensive threat, got into early foul trouble and finished with eight points. The game was a far cry from the Vikings’ 82-64 loss to the Gators at Shreve on Jan. 24. The future looks bright for Airline, which won three of its last four. Neal, Bilbo, Robinson, Hildebrand, Guest, guard Robby Dooley and forward Will Roberson are all underclassmen. At Parkway, the Panthers trailed 37-36 at the half and then led the Yellow Jackets for most of the second half. Parkway had a six-point lead with just over six minute to play. The Jackets rallied to tie the game at 67. Brodrick Jefferson made two free throws with just over a minute left. 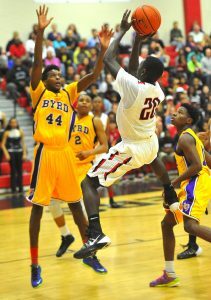 Parkway got the ball back but missed the front end of a one-and-one with 30 seconds left, giving Byrd the final chance. Jefferson, a Louisiana Tech football signee, scored 28 points in his final game as a Panther. Thomas led Byrd with 27. Elsewhere, Haughton (7-19, 0-10) closed its season with a 75-66 home loss to Southwood (18-11, 7-3), which finished third in the district.